Occupational exposure to asbestos has been related to the development of lung and pleural diseases including asbestosis, lung cancer and malignant mesothelioma. Cases of mesothelioma have also been described in individuals exposed to naturally occurring asbestos or asbestos-like minerals in Turkey, Greece, Cyprus, Corsica, Sicily (Italy) and New Caledonia. Therefore, in recent years, the awareness of possible health hazards related to environmental exposure to asbestos and asbestiform minerals has been increasing. New Caledonia is covered by more than a third of its surface with ultramafic rocks, mainly peridotites and serpentinites. The presence of asbestiform minerals in the New Caledonian quarries has been clearly established and included amphiboles but also hydrated serpentines (antigorite, chrysotile). 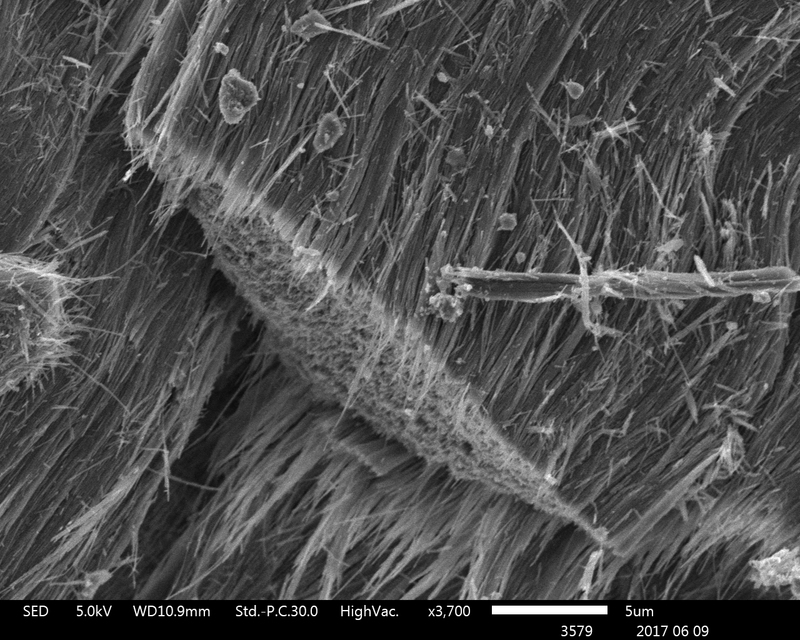 The fibers can be released in the environment following weathering of asbestos-bearing rocks and/or human activities on asbestos-rich soil. This make environmental asbestos a major public health problem for New Caledonia. A particular interest has been given to antigorite, a fibrous mineral largely present in the Caledonian territory. To assess the health risk posed by antigorite, a multidisciplinary project supported by the Centre National de Recherche Technologique (CNRT-Nouvelle Calédonie) has been carried out with the aim of characterizing the physico-chemical properties of the fibers and evaluating their toxicity profile. We have examined, by means of cell-free tests, two surface properties of the fibers regarded by the scientific community as relevant to mediate pathogenicity: potential to release free radicals and selective release of iron ions in the presence of endogenous chelators. Fiber dissolution in simulated body fluids was also measured. We have then examined in human epithelial cells and in murine macrophages the following effects: i) cytotoxicity; ii) induction of oxidative stress; iii) induction of NO synthesis; iv) genotoxicity. The results have been compared with those obtained with an Italian sample of antigorite and with chrysotile, a serpentine asbestos with well-known toxicity.